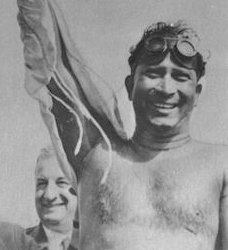 Mihir Sen was the first Asian who have crossed the English Channel. He was born on 16th November 1930 in Purulia (West Bengal). He was a lawyer by profession, a barrister of Kolkatta High court. In 1966, he established 5 important records and became an extra ordinary salt water swimmer. In 1958, Mihir Sen swam across the English Channel, in 1966 he crossed the Palk strait, followed by Gibralter Dar-E-Daniyal, Wasphorus and Panama. He thus established the record of swimming the longest distance. He is a matchless swimmer, having swam more than 600km in sea/ocean water. In 1959 he was awarded "Padma Shree" and in 1967 "Padma Bhushan". He brought glory to his motherland by creating records and earning a place in Guinness Book of World Record.